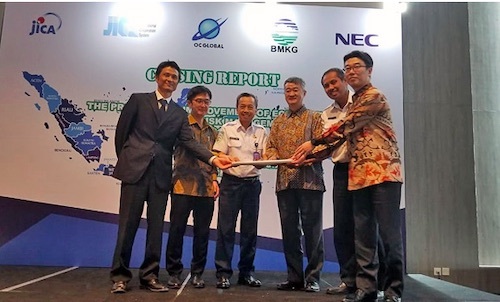 TOKYO, Dec 21, 2018 - (JCN Newswire) - NEC Corporation (TSE: 6701) has completed a wide-area disaster prevention system in Indonesia that quickly and effectively detects earthquakes. The system will be operated by the Badan Meteorologi, Klimatologi, dan Geofisika (BMKG), the Meteorology, Climatology, and Geophysical Agency of Indonesia, and was constructed under a grant for disaster prevention and reconstruction sponsored by the Japanese government. This wide-area disaster prevention system, which has been under construction since March 2017, is already gathering seismic intensity and waveform information obtained from seismometers and accelerometers newly installed at 93 sites across Indonesia. Data is provided in real-time to a server at the headquarters of the Meteorological, Climatological and Geophysical Agency in Jakarta via a satellite-based communication system (VSAT). These operations enable the Meteorological, Climatological and Geophysical Agency to monitor seismic activity constantly and improve the accuracy of epicenter analysis and magnitude estimation. Going forward, this system is expected to contribute to the advanced understanding of and preparation for earthquakes.